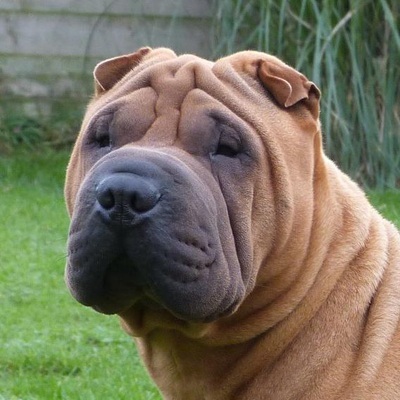 The Shar Pei comes in different coat types - horse, brush and bear coat. 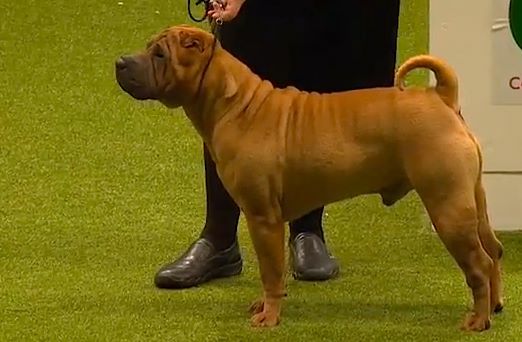 The horse coat is rough to the touch and prickly and is thought to be closer to the original Shar Pei breed in coat type than the brush or bear variations of the coat. The brush coated variety has slightly longer hair and a smoother feel to it. The bear coated variety is longer yet again and has a similar appearance to it of the Chow. The coat is so harsh in some aspects, that occasionally some humans can develop a prickly type rash allergy to it. The coat itself is usually solid in colour and is seen in red, black, cream, brown, blue, sable, fawn and apricot to name a few. The skin pigmentation is black inside the mouth including the tongue, with a domed forehead, small triangular shaped ears and deep set eyes. The tail is short, thick and curls over its back. All in all, the impression Shar Pei should give is one of solid strength with an overall body that is well muscled. Brush Coat Shar peis of the brush coat variety have slightly longer and softer hair than their horse coat counterparts. They stay somewhat more wrinkled as adults, which makes them the most popular variety. They're heavier and stockier than horse coat shar peis -- and have larger heads and muzzles -- so you need to be sure you can handle one. Despite their heft, they're generally laid-back around the house, and are content to snuggle up on the couch. 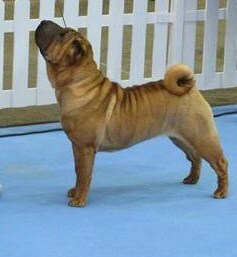 Horse coat shar peis have the shortest and roughest hair or all three types. They also change the most significantly in appearance from puppy to adult. While, as puppies, they're little balls of wrinkled skin, as adults they have mostly smooth skin and a lean, athletic build. As they don't develop an undercoat in the winter, they shed less than other types, but may be less adept in cold weather. They tend to be the most active and intense of the three varieties.